A mantra thrown around the column circuit from time to time is the idea that, back in the good old days, parents were parents and children were taught responsibility, duty, and thrift. Scenes like this no doubt abounded. . .
Embedded in this picture is the idea that adolescence as a distinct stage of life was an invention of the Victorians in the mid-19th century. This essentially artificial creation of a previously non-existent stage then created all sorts of problems that we deal with in the modern world, as our youth postpone “growing up” well beyond what is “normal,” or at least what existed before the Victorians ruined everything. Many commentators point to the laws against child-labor, and the increase of wealth during the late 19th century that allowed for children to have more leisure, and so on. The argument makes sense logically. 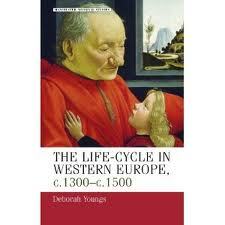 In her book The Life Cycle of Western Europe, ca. 1300-1500 (“Take courage,” I thought to myself as I picked it up, “The book can’t possibly be as boring as the title.”), Deborah Youngs sets out, at least in part, to debunk this modern notion. The medievals viewed life as happening in 4-5 distinct stages, with different expectations for each stage. Childhood, and yes, adolescence, has its roots far beyond the Victorians. Logical, common sense must give way to the historical record. The medievals in general were much less concerned with one’s actual age, however much they fixated on “stage of life.” When Henry IV of France sought an annulment of his marriage based on the fact that he was too young to give legal consent, no one could remember exactly when he was born. Opinion varied — some said he was 12 at the time of the betrothal (which would have allowed an annulment) and some said he was 15 (he would have to stay married). Adolescents (12-18) were universally acknowledged to be in an irresponsible stage. Medieval literature expected erratic behavior from them. They simply had too much “heat” in their bodies and too little reason to control it. Many of us might have an image of an authoritarian and rigid medieval culture, but to my mind they were surprisingly tolerant. For example, boys who engaged in homosexual activity under 18 were given a “free pass” of sorts. After 18, not so much. Some might not find this “tolerant” at all. But if you account for the fact that they believed homosexual behavior to be a great sin, then by their standards they were tolerant, at least in this respect. Some might guess that medieval culture expected all to be “saints” from the toddler years on, but again, the data confounds our expectations. The key for them was “acting your age.” Each stage came with certain expected behaviors. True, acting outside these expectations brought censure, but this held true even with “good” behavior. For example, regarding piety, they had a saying: “Young saints make old devils.” Those who have read Belloc’s The Path to Rome might recall him saying that he always felt much more comfortable when altar boys made faces at each other rather than standing with scrupulous and solemn attention to duty. If boys were boys, he took it as a sign that all was right with the world. In this way, some medievals had more of a sense of “stages of life” than most moderns, who see human nature as more fungible than those in the past. Youngs argues for no main thesis, but underneath her writing runs the current of the universality of human nature. We lack a sense of the past, and this opens us up to think unrealistically about the present. We exaggerate our virtues, vices, problems, and successes. Youngs reminds us that six year olds have always been noisy, and that twelve year olds have never been responsible. Parents, take heart, we are not alone. Most of their ideas regarding “stages of life” bear a general similarity to ours, with one exception: the final stage. I think if you asked most people what kind of death they preferred they would answer, “Quick and painless.” Medievals had a different perspective. A quick death robbed one of the chance to prepare, to “pack” for the final journey. Medievals wanted the chance to reconcile with God and man, and provide a firm legal pathway for their relatives. Here I think they had an advantage over us. In general they did not ignore or flee from death, but called a spade a spade. Again we are faced with the possibility that medievals did a better job facing reality than we do currently.